"Have a review of a film that used the backlot (either completely or just for a scene counts)? Interested in the history of the site? As long as it pertains to Universal Studios Hollywood and the backlot it counts!" Stanley Kramer's IT'S A MAD MAD MAD MAD WORLD (1963) is one of the most monumental cinematic achievements in film history. The film features practically every big name in comedy history, from Buster Keaton to the Three Stooges and everything in between. Although the plot is fairly simple, it touches at the bedrock of some very significant themes: primarily greed, but also fear, courage, and loyalty. Kramer shot the film at a number of locations throughout southern California, including Long Beach, Malibu, Santa Monica, and Palm Springs. Most of the movie is filmed outdoors, in the desert and on the roads, but the first scene filmed was in a makeshift hardware store on the Universal Studios Backlot. Before I discuss the making of that scene, first let's talk about the people behind this historic movie. Composer Ernest Gold had worked with Stanley Kramer on a number of his projects. Gold appreciated the way Kramer always left room in the filming for music and allowed for the music to become a part of the story. Gold was on the set or on location for almost every day of shooting, which is an unusual thing for the film composer to do. He wanted to get a sense of the action as it was happening so that he could better put it to music. He got the idea for using a carnival-themed tune when he was watching a car chase around a big tree and it reminded him of a merry-go-round. In the original showing of MAD WORLD in theatres, the film also included a lengthy intermission which featured Gold's score. Carey Loftin is considered by many to be the greatest stunt driver ever in Hollywood. His career spanned from 1939 to 1990 - he continued to do stunt work well into his 70s! 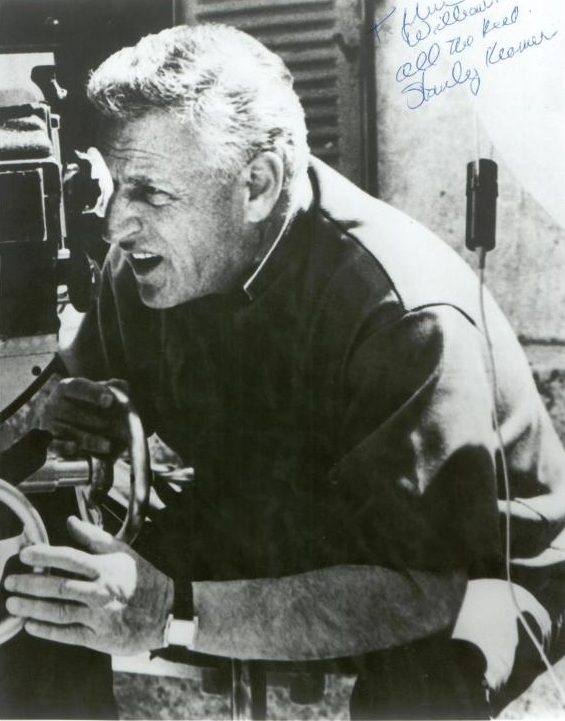 He is known for his work in such films as REBEL WITHOUT A CAUSE (1955), SPARTACUS (1960), THE LOVE BUG (1968), PATTON (1970), and S.O.B. (1981). MAD WORLD includes many many car chases, airplane stunts, prat falls, fights, you name it, and Loftin directed all of it, doing a lot of the stunt driving himself. But he and Kramer did not always see eye to eye when making MAD WORLD. One night, Kramer saw Loftin in the bar drinking and said he'd better get to bed because he had some crazy work to do the next day. So Loftin hurried off to bed and sobered himself up, only to discover the next day that all he had to do was kick a bucket! He read the production sheets after that. One of the most popular scenes of MAD WORLD is when Monica (Edie Adams) and Melville (Sid Caesar) accidentally lock themselves in the basement of a hardware store and try desperately by any means possible to free themselves. This scene was the first to be filmed and it was shot on a set on the Universal backlot. Apparently, for some reason all the tools kept disappearing throughout production so the props department had to keep restocking the shelves! Stunts and special effects had a field day with this scene, which involved dynamite, fireworks, electricity, fire, fire extinguishers, paint, and sledgehammers. Special effects man Danny Lee said, "We had fireworks coming out our ears. It was a hot set!" Sid Caesar and Edie Adams did in fact film the scene themselves, with real explosives and without doubles. Caesar had eight different suits in progressive states of disarray so he was constantly changing his costumes as Melville frantically tried to find a way out of the hardware store. It took 85 takes to get the scene just right. First, they were struggling to accidentally-on-purpose knock the torch in a position where it could start the fire. Then the steel door Melville hits with the sledgehammer kept falling open after a few swings, so they had to reinforce it. It is a crazy scene, toward the end of the picture, and it is very stressful. But you could say that about most of this movie. If you have never seen IT'S A MAD MAD MAD MAD WORLD, I strongly recommend that you get yourself a copy as soon as possible. It is a comedy classic I have enjoyed for many years. One of the best things about it is that there are so mane famous faces, and there is so much going on on screen, you could watch it a thousand times and always catch something new. The actors and comedians all give outstanding performances, but pay special attention to Spencer Tracy and to Ethel Merman. Those two in particular are not known for their comedic work, and yet they give the two funniest performances in the picture. I would love to hear what you like best about this picture. Do you have a favorite comedian in the cast? I look forward to hearing your feedback about this cinematic gem of a movie! I remember the first time I saw this movie and how SHOCKED I was by the ending. Never saw it coming. This film has been a treasure in my family for ages - my mom always says to my sister, jokingly: "Oh Emiline, shut up!" My favorite character is the mother-in-law (Ethel Merman). I'd love to play her. Thanks, Jenn! She's my favorite too - that voice! Great review! I love this film - there is so much going on all the time and has all those good parts for so many famous faces. Ethel Merman's Broadway reviews commented on her pin-sharp comic timing, so I wasn't surprised she was spot-on in this. I do get a bit cross with the "old bat" tag the character was given as Ethel was 55 when it was made, not much older than some of the other stars,and you don't have to be old to be a shrew. All the pratfalls she had to do let her show she had great legs for an older woman, too! Agreed. It's hard to believe that she's supposed to be Emeline's mother - maybe her much older sister? Thanks for commenting! Great Review! I love this movie! My dad showed it to me and my siblings when we were little and it has been one of our favorites ever since.